Projectors, promotion, prizes and a bit of emo! From Nat’s I rushed over to the Rep Theatre to cover an event for Corporate Arts Club. It was a bit like the arts version of that Dragon’s Den TV show. 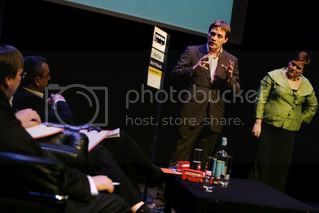 I photographed the pitches, the award presentation (won by a group wanting to put ballet on buses around Birmingham!) and the schmoozing after the event. It was actually quite interesting and the people were all nice and friendly. The light was tricky though – very dark during the presentations save for a couple of spotlights. I played with ISOs and shutter speeds and managed to get a good selection of shots so they should be happy. They always want the photos straight away which is fine but I just wish I’d had more time today to go through them. The day started with a meeting with Rob Norris who’s looking for companies to advertise on a new screen inside a children’s indoor play area. The company make you a video advert and play it on a loop every 7 minutes. It’s quite a cool idea as there are always parents sat around doing nothing while their brats play on the slides, etc. It is quite pricey though. I’d like to do it but I’m not sure I can justify it at the moment. And I’m sure Evelyne will just say no to it! She’s better with money than I am! This afternoon met with Lee from Ditto Music who are the company behind getting the first unsigned band into the UK Top 40. They’re looking for a photographer to work with unsigned bands to provide press shots and liked my stuff. I’m certainly up for it but I know how most unsigned bands are happy to use their mate’s crappy snapshot rather than spend a little bit of cash getting good images. Still, there’s enough unsigned bands in the UK for me to do ten a day and not even scrape the surface, so we’ll see what happens. From there I popped in to another designer kids clothes shop to see if they’d take our brochures. They did happily and seemed interested in getting some photos done for their catalogue. They have my number..
At 3:30 I met Kerry & Martin whose wedding I’m shooting on 1st April. We met at the venue and had a look around so that I could get some ideas of where best to shoot. We got some good ideas and found a nice park next to the hotel which will work well for group shots and photos of the happy couple. I just hope the weather is kind to us. I showed them some album samles too and they seemed really impressed with those so I’m looking forward to the day we give them their own finished album. Dave from Fused was there too and gave me a free pair of Levi’s jeans that he’d got me as part of a promotion thing. Nice. I need new jeans.